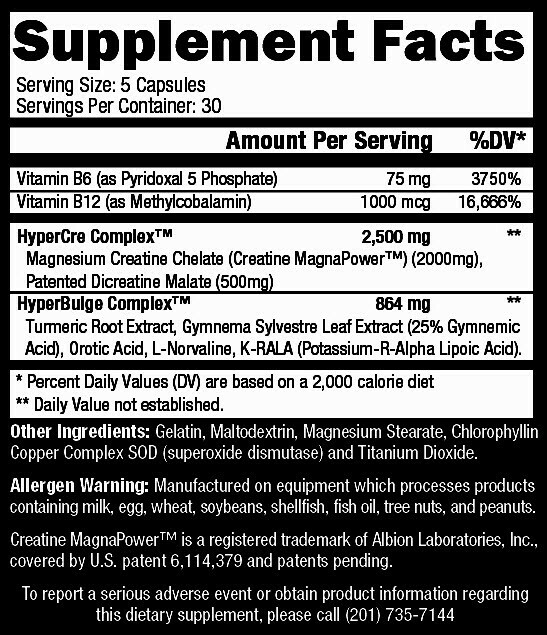 This is probably one of the best supplements you’ve never heard of, the more I look at the ingredients list the more I realise the sheer genius that went into this formula. 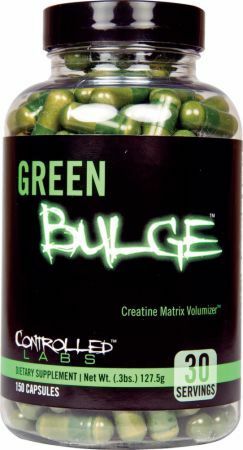 What we essentially have at first glance is a rapidly absorbable capsule style creatine, which I love to begin with as its great on the stomach and easy to take on the go – just throw the bottle in your gym bag and your loaded with creatine on a daily basis. However what has been built into this little gem is an exceptional insulin mimetic formula, anyone who knows me knows I love insulin mimicking formulas – they stuff carbs into your muscle creating an awesome pump and reducing fat stores. This is amazing for growth and recomp but more then that you look awesome with thick full muscle and less pudginess even on a bulk. So by combining this with a creatine formula we have the added effect of transporting creatine right to where its needed in the muscle tissue, just take it with a little carbs in your pre workout meal and strap yourself in for an amazing carb / creatine pump during your workout. On top of that you also have B6 & B12 for energy production and nutrient transport. I love this supplement! If you haven’t tried an insulin mimetic and you also need a creatine solution try this first, your in for a good tie and its a bargain. 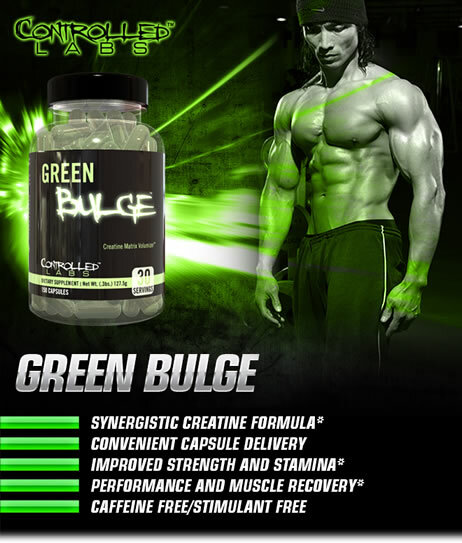 CONTROLLED LABS has responded to customer demand and the result: Green BULGE, Advanced Creatine Volumizer Supplement new and improved, delivering a synergistic formula you can actually feel working during your workouts. The exclusive stimulant-free HyperBULGE complex features Turmeric, GYMnemic Acid, and more…. boosting performance while taking muscle recovery / regeneration to the next level. The HyperCRE complex features a potent combination of patented Magnesium Creatine Chelate and 2CM (Dicreatine Malate), beneficial during both anaerobic and aerobic workouts and involved in the efficient production and utilization of ATP. Featuring clinically proven active ingredients and potent B Vitamins, this exclusive formula also has oxygen-sparing effects and helps optimize mitochondrial function to directly and indirectly boost performance during your workout or cardio session. Discover what many natural athletes already know…. Green BULGE DELIVERS! Selsby JT, DiSilvestro RA, Devor ST. Mg2+-creatine chelate and a low-dose creatine supplementation regimen improve exercise performance. J Strength Cond Res. 2004 May;18(2):311-5.2. Brilla LR, Giroux MS, Taylor A, Knutzen KM. Magnesium-creatine supplementation effects on body water. Metabolism. 2003 Sep;52(9):1136-40.3. Fukuhiro Y, Wowk M, Ou R, Rosenfeldt F, Pepe S. Cardioplegic strategies for calcium control: low Ca(2+), high Mg(2+), citrate, or Na(+)/H(+) exchange inhibitor HOE-642. Circulation. 2000 Nov 7;102(19 Suppl 3):III319-25. Lamb GD, Stephenson DG. Effect of Mg2+ on the control of Ca2+ release in skeletal muscle fibres of the toad. J Physiol. 1991 Mar;434:507-28.